4.Spoon sauce onto 1 side of 4 individual serving plates. Arrange squash and mashed potatoes (if using) on opposite side of sauce. 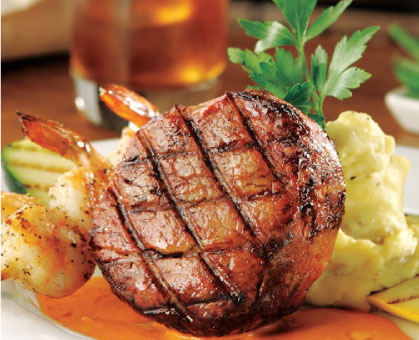 Arrange steaks on an angle against mashed potatoes and place drops of remaining oil on outer edge of sauce. Garnish with parsley, if desired. > Turn this into Surf ‘n Turf by adding grilled shrimp.